If you want to brew the best French press coffee possible, then you are going to need the best quality grinder you can find. You need a coffee bean mill, either manual or electric, that will allow you to get a good grind. What’s a good grind for French press coffee? It’s a very consistent coarse grind, which is key. While the exact coarseness of the grind can be tinkered with, the important thing is that all of the coffee grounds are equal in size. And that’s where a French press grinder comes in handy. A good coffee grinder for French press will ensure that all of the pieces are the same size. This ensures that hot water interacts with them equally and also means that their essential oils, flavors, and aromas are equally extracted from them. Which is why we’ve selected ten of the best models we could find. It doesn’t matter if the user needs to grind beans coarsely for French press coffee or need to grind them finely for espresso, this machine is up to the task. It uses 40mm European-made burrs that provide a uniform grind each and every time. And grind levels can easily be adjusted. This product also has a powerful and very durable gearbox that drives the transmission with force but does it in a way that helps to decrease overall noise levels. Its high-torque DC motor doesn’t heat up as other competing motors, which ensures that the quality of the beans isn’t affected by excess heat. Designed to handle a variety of grinds, this manual coffee grinder for French press applications can be used for all kinds of different brews. Up to 100-grams of coffee grounds can be loaded into its hopper and its top locks on quickly and easily. It has 8-different settings which allow the user to select grind coarseness from espresso all the way up to French press coffees. And in between most of these settings is a half-setting, so the user has 15-different coarseness levels, in general, to choose from for grinding their favorite beans. It’s a manual grinder made to be easy-to-use and to require little effort to use it. With a stainless-steel finish that allows it to be stored in a prominent position on the coffee drinker’s counter, this grinder is a perfect addition to anyone’s collection of coffee making tools. It has a powerful 100-watt motor that drives conical burrs which deliver a high-quality and very consistent grind each and every time. This product has 16-different grind settings, holds 8.5-ounces of coffee beans and its ground container can hold up to 4-ounces of grinds. Other interesting features found on this unit include a safety lock system, removable upper burrs for easy cleaning and a timer which goes from 5-seconds through 60-seconds. Fifteen different grind settings and a heavy-duty conical burr disc allow this electric grinder to grind coffee beans to a variety of coarseness levels. Users can set it to grind coffee for Turkish coffees, French press coffees or for cappuccinos. It has a sleek and stylish design that doesn’t take a whole lot of counter space and complements just about anyone’s home decor. Its automatic bean hopper can be easily removed, so it can be easily cleaned. It has a 120-volt motor, an easy-to-use on/off button and a see-through bean hopper. And since it’s ETL-certified, users can rest assured that the product is as safe to use as it is efficient. 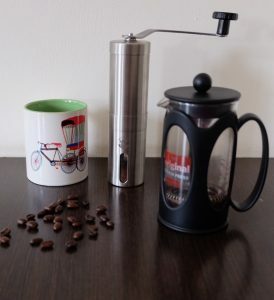 Although this grinder uses a stainless-steel blade instead of conical burrs like other of the top French press grinders, it is capable of delivering both a coarse grind and a fine grind. 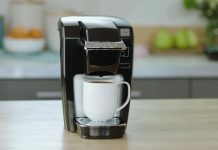 It has a 14-cup capacity and has multiple grind settings which allow the user to set it for customized results. It has a removable grinding chamber, hidden cord storage and can be operated with just the push of a button. When it’s finished, it will automatically shut-off as well. All of these features allow it to be a very versatile machine for whatever coffee the user needs beans. And it’s a fairly inexpensive grinder as well. Available in one of three exciting colors which include cranberry red, sesame black and brushed stainless-steel, there is a Breville Smart Grinder that fits in with just about any decor. This machine isn’t just about style, however. It also has a number of features which make it extremely useful. It has 60-precise grind settings that allow users to grind everything from espresso grounds to French press grounds. It also has a 16-ounce bean capacity and has the ability to grind directly into a French Press canister, a grinds container, a gold-tone filter, porta-filter or paper filter. And since it uses conical burrs, it grinds the beans to a very consistent level. This inexpensive electric grinder uses stainless steel blades instead of burrs, but it still manages to deliver a consistent grind that’s good enough for everything from French press coffees to espressos. It’s made with a stainless-steel housing and has a 2.1-ounce bean capacity. It can easily be taken apart so the user can clean it and has power cord storage that makes it easy to store. Another key feature found on this unit is a lid safety lock which makes it safe to use. This product can not only be used for grinding coffee beans for French press coffees but can also be used to grind peppercorns or herbs. This portable and effective manual grinder is perfect for just about any French press coffee brewing operation. It features dual conical burrs and a nice easy-to-use handle that allows users to grind their beans perfectly without all of the heat that is associated with electric models. It’s been newly updated with a stabilizer washer that keeps the lower burrs stable, so the grind consistency is perfect each and every time. Its bottom part is a see-through grounds container that’s stable enough to set on the table and gives the user extra leverage while they’re grinding their favorite coffee beans. This coffee mill is great for making French press coffees or for any coffee which needs a consistent grind. It has 18-different click settings that give the user precise control over their grind. Since it’s a manual grinder, this product doesn’t require a power cord or batteries. All it needs is the user. And unlike some manual models, it’s not hard to use because it has a nice long handle for leverage. This product is extremely quiet, so it can be used early in the morning without waking the entire household. Since this product is made with ceramic combo burrs instead of stainless steel ones, it’s durable and should provide the user with plenty of service life. This high-quality manual grinder is made to provide the user with years of coffee bean grinding. It has a stainless steel design with 18 click setting that gives the user the utmost control over their grind. It also has combo ceramic burrs which grind consistently enough to produce grinds for cold brew, French press, percolator, and drip coffees. This product is ultra-quiet and has a nice long handle that makes it easy to grind. It also has a nice see-through window in its body which allows the user to see just how much coffee they have ground. And all of these features make this one of the best French press mills currently available. Once you’ve bought your coffee grinder for French press coffees, then you are ready to start using your French press coffee maker. But making a great cup of coffee isn’t as simple as boiling water, grinding some beans and throwing it all in the coffee maker. Believe it or not, there is actually a science behind making this type of coffee; A subject we’re going to go over right now. Before we begin, however, it should be mentioned that the following procedure for making French press coffee is not etched into stone. 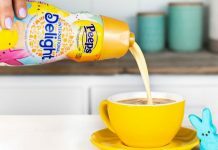 What I mean is that you are probably going to want to tinker with the procedure a little bit to customize your coffee to your personal preferences. Having said that, let’s get down to brewing some coffee. It shouldn’t be surprising that the grind is the most important aspect to worry about. 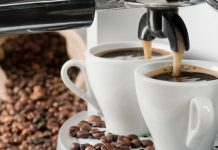 If you don’t have the right grind, then you are going to end up with coffee that’s too weak or coffee that has too many floating coffee particles. The grind should have a consistency that’s somewhat coarse, but not too coarse. The consistency should be somewhere between steel-cut oats and coarse sea salt. Depending on the type of coffee press grinder you chose, that can be hard to determine, at least in the beginning. You are probably going to have to do some trial and error to come up with the right consistency, so be sure to take notes and be prepared to use some extra coffee beans while you’re experimenting. Eventually, you’ll find the grind size that’s right for you and will have learned how to get the coffee bean mill to grind it to that consistency. The next question that often comes up during French press coffee discussions is just how much ground coffee should be used. Well, that’s not always a question to answer. A lot of it depends on the coffee drinker’s preferences, but there is a ratio you can try in the beginning. The ratio is a ½ of a cup of ground coffee beans per 32-ounces of water. It’s that simple. However, like I said, that’s probably a ratio you’re going to want to experiment with. Load it up in your press and you’re ready for the next step. Using high-quality water is extremely important to make the best coffee possible. Filtering water is a good way to get the water you need, or you can simply purchase purified water. Just be sure that the water you choose isn’t the distilled type. That’s because distilled water is completely devoid of minerals and it has a very flat taste to it. And flat tasting water doesn’t make good coffee. So be sure to use filtered tap water or buy purified water with minerals in it. Now it’s time to start boiling the water. Once the water has reached the boiling point, turn off the heat and let the water sit for a full minute. Why so long? That’s because the ideal brewing temperature of the coffee is around 195-degrees Fahrenheit. And if you allow the water to sit for a full minute, then it’s the perfect temperature for brewing coffee. If you’re not sure that’s the right temperature, then you can always check it with a candy thermometer. Pour half of your water over the grounds and give it a gentle stir with a bamboo chopstick or a spoon. Then wait for 30-seconds. This waiting period is crucial because it gives your coffee grounds an opportunity to bloom. The “bloom” this when the gasses and essential oils are released from the coffee grounds. This allows the coffee to develop its aroma and its flavor. Now it’s time to pour the remainder of the hot water into the French press and put on the lid. However, don’t plunge it just yet. You should wait for 4 to 4.5-minutes to allow the coffee grinds to steep. This is the part when the coffee actually gets brewed, so be sure not to brew it too little or too much. Which means that you should probably set a timer so you don’t overshoot or undershoot the time. Now it’s time to push down the plunger on the French press slowly. Yes, you’ve put in some time and effort to ensure that you get the richest and tastiest coffee you can get, so you don’t want to ruin it by slamming down the plunger. Slowly, but steadily, push the plunger down to the bottom of the press. Now you’re close to being done but aren’t quite there yet because the next step is vitally important. Remove the lid and serve your coffee right away. You don’t want the coffee to sit in the press because it will continue to brew and this will lead to the coffee being over extracted. If you made more than you could drink in a single cup, then pour the coffee into a coffee thermos to keep it warm until you’re ready for another cup. Roast Your Own Beans – If possible, roast your own beans for really great tasting coffee. Otherwise, be sure to buy high-quality beans and grind them yourself in your favorite French press grinder. Keep Your Grinder Clean – It’s important that you keep your grinder in good shape and as clean as possible to prevent funky flavors from building up in it. Warm Your French Press – Warming your French press before you begin brewing can ensure that all of the heat goes to extracting the grounds and doesn’t get wasted warming up the machine itself. It’s easy to see that making French press coffee is not only a way to make great but making it is also an art. From using a coffee grinder for the French press to grind the beans to using the best water possible for coffee extraction, everything has to be taken into consideration to create a beautiful cup of coffee. Learning how to do it correctly will ensure that you have great tasting coffee available to you every morning.